MY RECOMMENDATION: YES if you're a Yankee fan. Boo hiss if you're not! BLOG DESCRIPTION: Pinstripe Alley is your source for the latest Yankees news and game recaps. This blog provides a forum for passionate fans all year round. MY REVIEW: Okay, I really, really dislike the Yankees (boo, hiss!) but there’s no denying that they’re a great team and they’ve got tons of fans. 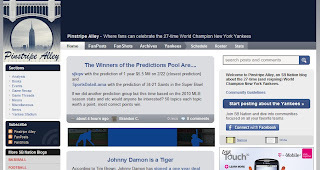 And those tons of fans will want to subscribe to this blog, just to get all the news about the team in one place. I personally don’t care for bloggers who use words like “suckitude”, but that’s the current generation for ya! This is another blog hosted on Sportsblog Nation. Unlike FishStripes (which I also reviewed today), which had only one author, Craig (at least at this time in the year); Pinstripe Alley appears to have several – Travis G., jscape2000, CrazyYankeeChick, and so on. Some of these blog entries are the kind where you have to click on a link to go to a webpage to see the full story, but so many of them are the full article, so I’ll give that a pass. THE GOOD: Lots of fans giving their own perspective of the Yankees. Well written, informative. These fans know their stuff. THE BAD: Well, it is a Yankees blog!